A few months ago we were able to make contact with a Turkish business who specialise in the manufacture of spice grinders. Indeed, this family has been making grinders for five generations. A spice grinder is the ideal thing to have so that you grind just enough whole spice for the meal you are preparing. That way, the spices you use are always at their freshest. The first of these solid brass, Turkish spice grinders was very popular. However, as we spent more time discussing customer requirements and researching the differences available, it became apparent that the “original” spice grinder would not suffice for all spice tasks. Accordingly, we now have three different grinders available. Each of them are just gorgeous but we do have a soft spot for the original (which is the smallest). A spice grinder is a perfect and practical addition to your spice kit or an attractive and unusual gift for the cook who has (almost) everything! On the left, the ornate spice grinder; it is approx 10cm high, made of solid brass with a steel grinding mechanism. The spices are placed in the top slot and, when ground, fall into the holding chamber which can be separated from the grinding body, simply by twisting . 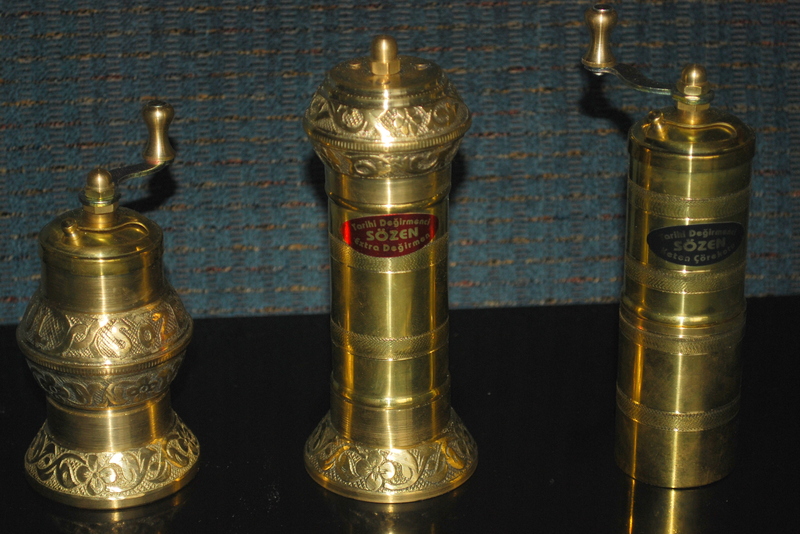 In the middle, the dial spice grinder; it is approx 14cm high, also made of solid brass with a steel grinding mechanism. This grinder is suited to larger spices (such as long peppercorns) and works similarly to the large pepper grinders that you see in Australia. The ground spice falls out of the grinding mechanism and drops onto the dish of food or wherever you want the spice to go. On the right, the long, mini spice grinder; it is approx 14cm high, made of solid brass with a steel grinding mechanism. The spices are placed in the top slot and, when ground, fall into the holding chamber which can be separated from the grinding body, simply by twisting. This grinder is similar to the ornate spice grinder, however the grinding mechanism is better suited to oily spices such as nigella, sesame and linseed. We are happy to provide advice on which spice grinder or grinders would best suit your needs. Prior to use, to clean the mechanism, grind rice and then discard. In order to keep the grinder nice and clean, it should be wiped with a dry cloth after every use. Do NOT immerse in water as the internal grinding mechanism will deteriorate. The grinder can be polished with a soft cloth and brasso or similar. 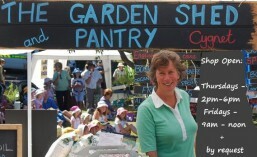 These Spice Grinders (and the freshest spices) can be obtained from the Cygnet Market or at the Garden Shed and Pantry. This entry was posted in Food and Ingredients, Kitchen accessories, Products and tagged healthy eating, something special. Bookmark the permalink.